Note: all my XF1 add-ons are still 100% free and are supported by donations. Shows activity of Administrative and Moderating user groups. 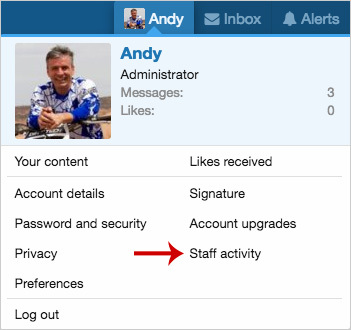 This add-on allows site owners to quickly see how active their staff members are. All phrases start with staffactivity_ for your convenience. Download Andy-StaffActivity-1.0.zip and unzip it. Copy the src/addons/Andy/StaffActivity directory to your server. A table called xf_andy_staff_activity is added to your database. Q: When will the Thread views start counting? A: The Thread views counter starts after the add-on has been installed. Q: Will the xf_andy_staff_activity table be automatically pruned? A: Yes. A Cron entry will prune to the days entry located in the Options page. Updated for XF v2.1 or newer. Also improved Options page to allow selecting User groups from a menu.